Aging. Gum disease risk naturally increases with age. We can lower the risk with an effective daily hygiene regimen, along with a minimum of two office cleanings and checkups each year. Brushing and flossing removes bacterial plaque and food particles which accumulate on tooth surfaces. The longer plaque remains in contact with gum tissues, the greater the chances of infection. Pregnancy. Although women tend to take better care of their teeth than men, they still face unique issues that increase their risk. During pregnancy, for example, certain hormone levels rise, which cause the gums to become more responsive to bacteria. Other hormonal fluctuations throughout a woman’s life, including taking certain drugs for birth control or during menopause, can cause similar situations. Family History. 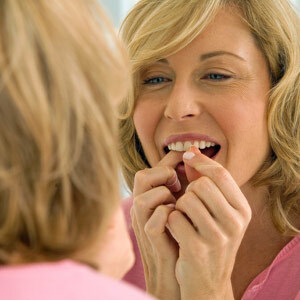 You could be at higher risk if members of your immediate family have a history of gum disease. Researchers estimate that 30% of the U.S. population has a genetic predisposition to the disease; it’s also possible for family members to transfer bacteria to other family members by way of saliva contact or shared eating utensils. Smoking. Nicotine, the active ingredient in tobacco smoke, causes changes in the blood vessels of the mouth that could inhibit the flow of antibodies (produced by the body to fight infection) in the bloodstream. As a result, smokers experience more rapid disease development and greater detachment between teeth and gums than non-smokers. Other Inflammatory Conditions. A number of studies indicate people with other inflammatory conditions like heart disease, arthritis or diabetes have a higher risk for gum disease. Some researchers have even suggested that bacteria associated with gum disease pass into the blood stream and threaten other parts of the body — an added incentive to seek treatment and stop the disease’s advancement. If you fall into any of these risk categories, it’s even more urgent that you practice effective daily hygiene with regular office checkups. Additionally, if you begin to notice bleeding gums, tenderness and swelling, or loose teeth, contact us as soon as possible for an evaluation. 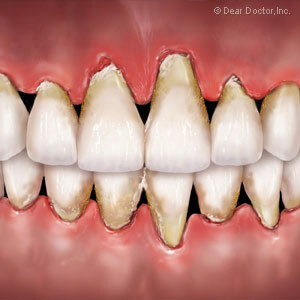 Periodontal (gum) disease is an infectious condition that if left untreated could lead to tooth loss. While gum disease is primarily caused by a thin layer of bacterial plaque and calculus left on the teeth due to poor hygiene, you may also have extenuating factors that may make you more susceptible to the disease. 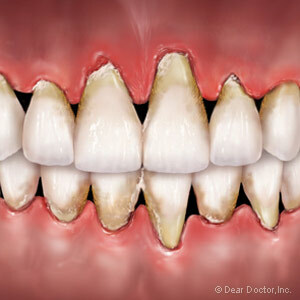 Gum disease is actually a group of infectious diseases in which some forms are more difficult to control than others. All these forms arise from interactions between the bacteria in the dental plaque and your body’s immune system. Depending on both your body’s individual response and the disease form, your resistance to the resulting bacterial infection may be low. That low resistance to certain strains of bacteria may be genetic — something you’ve inherited from your parents. Your stress level, particularly when it’s high, can also diminish your body’s ability to resist disease. There are also numerous strains of bacteria that could lead to gum disease — your body may not be able to effectively resist the particular “mix” of strains contained in your dental plaque. Aside from lifestyle issues like stress or oral hygiene, we can at least test and verify any susceptibility you may have due to uncontrollable factors like genetics or the particular bacterial makeup within your plaque. Unfortunately, a minority of people will continue to deal with gum disease even after treatment and adopting a more effective hygiene regimen. Although we can’t cure the disease, we can certainly control it with regular monitoring and treatment when necessary. The key is to adopt a long-term strategy that will seek to preserve the teeth for as long as possible. In some cases, the best treatment approach is to prolong the life of the affected teeth for as long as possible to give you time to prepare emotionally and financially for eventual tooth replacement. Indeed, any patient experiencing some form of gum disease should seek professional treatment, followed by a daily oral hygiene program and regular checkups and office cleanings. Taking the right steps in consultation with your dentist will assure you’ll preserve your teeth for as long as possible. It is sometimes hard to believe all of the features and characteristics that we inherit from our parents. Whether you're tall, short, blue-eyed or blonde, you can usually attribute some of these features to your mother and father. Of course, the downside of genetics is that diseases and disorders are also linked to genes. Well, you can add gum tissue to that list as well! Genetics actually determines whether you have what we call “thin” or “thick” gum tissue. How does this work? Well, the type of gum tissue you have relies heavily on the shape of your tooth, which indeed is genetically-coded. If you have a triangular tooth shape, you'll likely have thin gums. If you have a squarer tooth shape, you'll usually have thick gums. So, what can you expect from each tissue type? On the other hand, if you have a thicker tissue type, your gums are more vulnerable to dental disease through a condition called “pocketing.” This happens when bacterial plaque causes your tissue to become inflamed, lose its attachment to the teeth and develop a pocket. Pocketing can result in bone loss, and, in worst-case scenarios, tooth loss. It's important to note that while we use these terms to categorize different tissue types for treatment decisions, your tissue may also fall somewhere in between the two varieties. So, how can you prevent gum disease? Daily oral hygiene is the best way to ensure proper care of your gums, no matter what type you have. Be sure to brush twice daily (use a soft toothbrush) and floss regularly at night. Floss gently until you hear a squeak, but watch out for your gum line. And of course, continue to visit us two times a year, so that we can assess whether you are in danger of developing gum disease. Loose teeth are an exciting rite of passage in childhood; in adulthood, they're anything but. In fact, a permanent tooth that feels loose is a sign that you need to make an appointment with our office right away. The quicker we act, the better chance we will have of saving the tooth. What causes loose teeth? In the absence of a traumatic dental injury, the culprit is usually periodontal (gum) disease. This is a bacterial infection of the gum and/or bone tissues that surround and support your teeth. The infection is caused by bacterial plaque that sits on your teeth in the absence of effective oral hygiene. Over time, periodontal disease will cause gum tissue and eventually bone to detach from the teeth. As more of this supporting tissue is lost, the teeth will gradually become loose and (if the disease remains untreated) eventually fall out. Loose teeth can also be caused by a clenching or grinding habit that generates too much biting force. 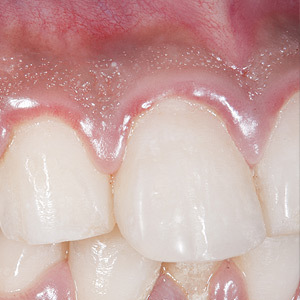 This force can stretch the periodontal ligaments that join the teeth to the supporting bone, making your teeth looser. Whether the cause of your tooth looseness is biological (gum disease) or mechanical (too much force), treatments are available here at the dental office. The first step in treating gum disease is a thorough cleaning to remove plaque and harder deposits on the teeth (tartar or calculus); this includes the tooth-root surfaces beneath the gum line. You will also be instructed on effective oral hygiene techniques and products to use at home. This type of therapy will promote healing of the gums that will cause some tightening of the teeth. Additional treatments will probably be necessary to gain the maximum healing response to allow the teeth to be most stable. For example, we may also want to temporarily or permanently splint the loose tooth or teeth to other teeth so that biting forces do not loosen them further. There are other mechanical approaches we can employ to prevent a loose tooth from receiving too much force. For example, we can reshape the tooth by removing tiny amounts of its surface enamel in order to change the way upper and lower teeth contact each other. We also may suggest a custom-made nightguard to protect your teeth if you have a nighttime grinding habit. Because its symptoms can be easy to overlook, gum disease is sometimes called a “silent” malady. But don't underestimate this problem! Untreated periodontal disease can progress into a serious condition, possibly leading to tooth loss and even systemic (whole-body) health issues. With proper preventive measures and appropriate treatment, however, the disease can be controlled. The root cause of periodontal disease — actually, a group of related diseases, all of which affect the tissues surrounding the teeth — is the buildup of bacterial plaque (also referred to as biofilm) around the gums. While hundreds of types of bacteria live in the mouth, only a comparatively few are thought to be harmful. But when oral hygiene (namely, brushing and flossing) is inadequate, the environment in the mouth becomes favorable to those harmful types. The disease often begins with inflammation of the gums called gingivitis. It symptoms include bad breath, bleeding gums, and soreness, redness, or tenderness of the gum tissue. However, in some people these early warning signs are ignored, or masked by the effects of harmful habits like smoking. Gum disease is chronic; that means, if left alone, it will worsen over time. Periodontitis, as it progresses, causes damage to the ligament that helps hold the tooth in place, as well as bone loss. This may become increasingly severe, and ultimately result in the loss of the tooth. Severe periodontitis is also associated with whole-body (systemic) inflammation, which has been linked to an increased incidence of cardiovascular diseases, like stroke and heart attack. But there's no reason to allow gum disease to progress to this stage! Prevention — that is, regular daily brushing and flossing as well as regular dental cleanings — is a primary means of keeping this problem at bay. Plus, every time you have a regular dental checkup, your gums are examined for early signs of trouble. Of course, if you notice the symptoms of gum disease, you should come in for a check-up as soon as you can. There are a number of effective treatments for gum disease. One of the most conservative, routine ways are those regular dental cleanings we referred to earlier, usually called scaling and root planning. Using hand-held and ultrasonic instruments, the buildup of plaque (tartar) is carefully removed, sometimes under local anesthesia. A follow-up evaluation may show that this treatment, carried out on a regular schedule, is all that's needed. Or, it may be time for a more comprehensive therapy.